Prize: Grand Prize. $500 family photoshoot, $250 Roots gift card, $250 Photobook Canada gift card and other surprises. 6 Weekly Winners will receive a $50 Photobook Canada gift card and other surprises. 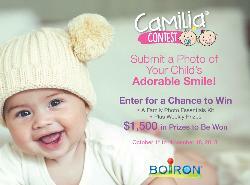 What you must do to enter: Complete the form and submit a photo of your child's adorable smile! earn up to five (5) bonus entries per day. Statistics: This contest was opened by 58 and entered by 2 ContestChest.com members. 3% of those who opened the contest, entered it.